Ergobaby is a parent favorite on weeSpring and with good reason. 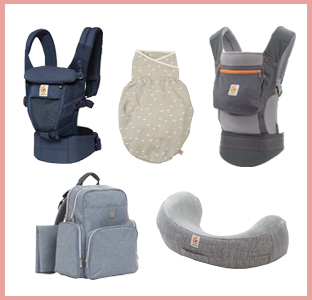 Their thoughtfully designed carriers and accessories are easy to use, comfortable for parents and baby, and made to last. You’ll win *two* carries, both the super lightweight and breathable Cool Air carrier as well as the Adapt carrier, adjustable for any baby from newborn to toddler, no insert needed. Also included is their new Anywhere I Go backpack diaper bag, compact but with space for everything you’ll need when out and about, their super comfortable and sturdy Natural Curve Nursing Pillow, as well as a set of their soft, comfy, and super easy to use swaddles. Find out more about Ergobaby. We are always fans of baby gear that doesn’t require doing weight-lifting in what (little) spare time you have to lug in and out of cars. 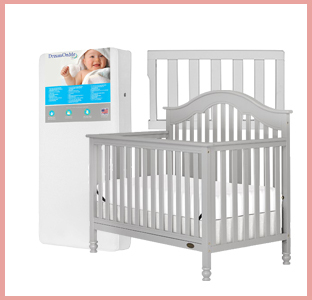 The folks at Graco seem to get that parents want what is safe, affordable, quality, and lightweight. 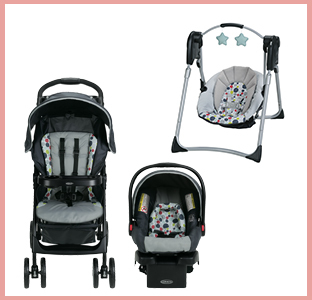 That’s why we’ve included their amazing LiteRider Stroller Travel System, which features an ultra-lightweight, fully featured stroller (with parent’s tray, a cup holder, and storage basket), and their popular SnugRide 22 Click Connect Infant car seat. Graco doesn’t just relegate their innovative designs to how babies travel though. We’ve also included their new sleek and unassuming Slim Spaces Compact baby swing featuring a height-adjustable design, an easy and compact fold, and a carry handle for simple travel and storage. Find out more about Graco. Find out more about Owlet. Check off a major component of your nursery with these beautifully and thoughtfully designed pieces from Dream on Me, including the Charlotte 5-in-1 crib that converts easily from crib to toddler bed to daybed to full-size headboard and footboard, growing with your child for years. Also included is the Bedtime 2-sided Crib Mattress. Proudly made in the US, this hypoallergenic, lead-and phthalate-free mattress features a firmer side to support your infant and can be flipped over to provide a little more cushy comfort for active toddlers. Find out more about Dream on Me. The mom-invented Boppy has been literally supporting ‘momkind’ for decades! Included is their new Multi-use Slipcovered Total Body Pillow, providing head-to-toe support to help make you and your bump more comfortable, the Classic Boppy Nursing Pillow, a Tummy Time Prop pillow, designed specifically to assist and engage littles during tummy time, a Newborn Lounger, easily portable and perfect for relaxing, and a Head & Neck Support insert for infants, providing safety, comfort, and support in strollers, bouncers, and more. 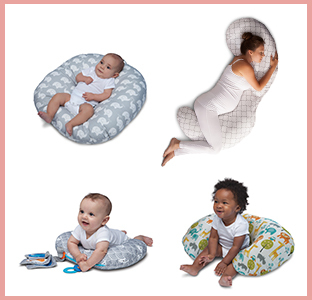 Find out more about Boppy. 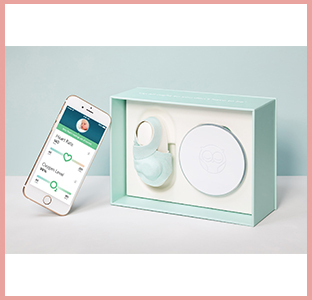 Evenflo has been a worldwide leader in innovative baby products for over 90 years–they totally know their stuff when it comes to feeding your new little one. 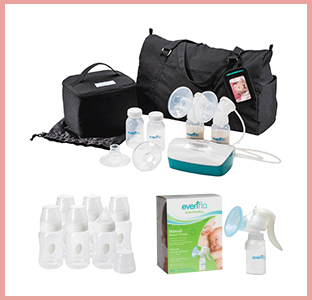 You’ll win their new Hush double electric breast pump, as well as a sleek pump shoulder bag filled with all the goodies a pumping mama will need, like milk storage bottles and bags, plus a cooler bag complete with ice packs. Also included is their uber portable manual hand pump (for even more convenient pumping on the go), as well as a set of their awesome Balance Plus bottles, designed to support bottle-feeding without interfering with breastfeeding all while reducing colic, reflux, and gas, as well as pumping bag adapters (so you can pump directly into these bottles). Find out more about Evenflo Feeding. All-natural baby soaps and lotions seem to be prevalent in today’s market, but not a lot are out there with the backing of third party certification! Earth Mama Angel Baby was founded by a mama who is a nurse and herbalist, and believes in the power of plant-based healing, as well as evidence-based research. They sell a variety of products from prenatal, postnatal, and breastfeeding, as well as products to help mothers who have suffered a loss. 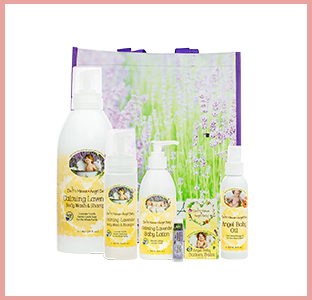 Included in this giveaway is a tote, a liter of Calming Lavender shampoo, 6 baby bottles of Calming Lavender body wash and shampoo, 4 bottom balms, 4 bottles of Calming Lavender baby lotion, 2 bottles of baby oil, and 3 Lavender Meringue lip balms (yay! something for mom). Find out more about Earth Mama. Our friends at Winnie have created an awesome local resource for new parents. It helps you find the nearest changing table and place to nurse and other family friendly destinations like playgrounds and kid-friendly restaurants. To learn more about our other media partners (who make these amazing giveaways possible), click on their links here: weeSpring, Scary Mommy, Motherly, Nameberry. Prize value is $2,300.82. For more information, please see our terms and conditions.